Add the line below to your script to make it work. 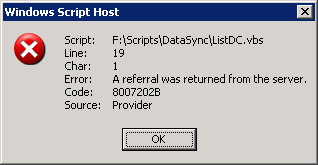 10 Responses for "A referral was returned from the server"
I’ve searched a while to find a solution for this problem! Dude, you rock! I have been struggling with this one for days and your solution nailed the problem!! Thanks. I was looking for a solution for this problem long !! This was an excellent post. Thanks so much for the help. I’ve been searching and searching for over 6 hours and you solved my problem!!! THANK YOU! Thanks a lot, you save me much time! Fantastic, it has been quite a while and this post is the only one talking about this on everything I have looked at. And yes, solved my problem! Thanks a lot! I cannot thank you enough. I have been searching for a solution since a long time. Is it just me or MS really gives you all the information except the thing you are looking for? If they reverse the NOT condition in their searches, they will be as successful as google.